A High Court judge has passed Westminster City Council’s bid for an injunction and judicial review into CS11, but said he was "exasperated" by both sides. In a two-and-a-half-hour hearing this morning, Mr Justice Holgate heard Westminster City Council believed Transport for London (TfL) hadn’t properly modelled traffic for parts of the route, including through St John’s Wood. Tristan Jones, acting for the borough, also alleged TfL hadn’t properly shared documents with Westminster City Council. But this was rebuffed by TfL, which said it had shared the same information for the plans with consultants from the council as it had on the Oxford Street pestrianisation plans. The High Court also heard the transport body hadn’t shown why the Swiss Cottage gyratory work and work on the 100 Avenue Road plans needed to take place simultaneously. Mr Jones said: "There has been no explanation why they most be done at the same time." Andrew Parkinson, who was assisting the claimant, raised campaigners’ concerns that the gyratory section would increase traffic elsewhere in the route. Meanwhile Timothy Straker QC, representing TfL, said the council’s "sudden" withdrawal was "politically motivated." He alleged that Westminster’s backing of the plans was dropped after May’s local elections. The Conservative-run authority jettisoned support for the Oxford Street works at around the same time. As TfL officers ferried information to him from the back of the court, he said: "If you look at Camden’s response to the consultation, they say they welcome the scheme because Swiss Cottage is so awful." Throughout the hearing, Mr Justice Holgate aired his frustrations. At one point he accused Mr Straker of "grandstanding" over the accusation Westminster City Council’s actions were politically motivated. He also said one authority taking the other to court was "like nothing I’ve seen before". "Why is the court being troubled by this?" he said. He urged the two parties to have informal mediation talks, and said they should be working together to agree the scheme. The approval means work beginning on July 30 is delayed, and a full judicial review hearing will take place on September 6. It is expected to last one day. Following the hearing, campaigner Jessica Learmond-Criqui told the Ham&High: "We are obviously delighted that the judge expressly acknowledged and recognised the concerns of residents about ran running and traffic displacement into Hampstead and St John’s Wood. "We were very ably assisted by the brilliant planning barrister Andrew Parkinson and couldn’t have done it without him. "TfL will not be able to start work before the final decision of the judicial review full hearing." She added: "The judge also mentioned there is a real prospect of an error of law in TfL’s decision [in March to begin work on Swiss Cottage]." 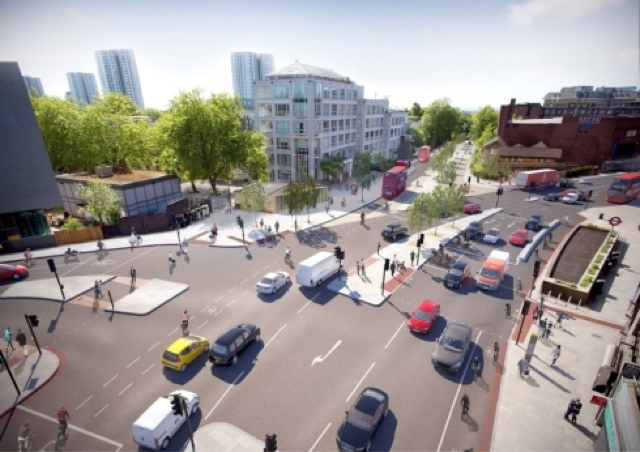 Ben Plowden, TfL’s director of strategy and network development, said CS11 was "a vitally important addition to London’s cycle network" and that work at Swiss Cottage would "make it a better place to live and work while reducing road danger for pedestrians and cyclists". Of the hearing result, he said only: "Construction was due to begin on July 30. This will now be delayed pending the outcome of a judicial review." Westminster’s environment chief, the rather more jubilant Cllr Tim Mitchell, said: "We are pleased with the High Court’s decision today which supports the council and residents’ right to be heard on CS11. "We are worried that CS11 will cause traffic displacement, increase congestion and lead to poorer air quality. "We are glad that the court has granted our injunction to stop works at Swiss Cottage until the very legitimate concerns with this scheme are addressed via a judicial review." And he insisted: "Westminster City Council fully supports safe cycling and we are making major investments for cyclists within Westminster."